From the Everquest 2 player manual: "The Templar profession is ideal for those who desire to excel in a role of support by conjuring powerful restorative and protective magic to benefit allies. 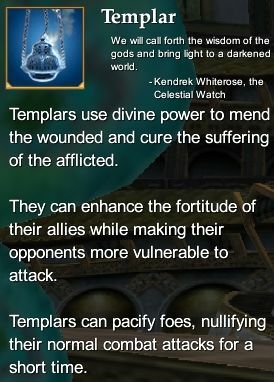 The Templar serves his party by mending the wounded and purging illness and suffering from the afflicted. The Templar may also use his powers to bestow temporary augmentations to his allies' defenses and attributes. As a secondary application of his divine powers, the Templar may invoke offensive powers that will hinder or harm adversaries." Templar Epic Weapon Series (80) - Rise of Kunark Templar Epic Weapon. This page last modified 2011-08-25 22:53:18.